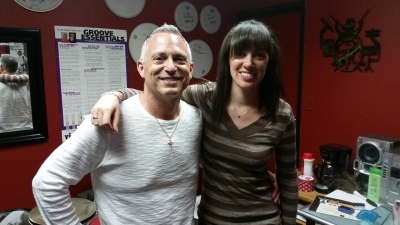 "Tony is an extremely nice guy, humble, patient, and a brilliant drummer. he's guiding me through stick control, and increasing my speed through rudiments. I've been playing for years but an accident set me back. Tony is the guy to rehab, and coach me. I'm bleesed to have found him and as with him I won't just return to form, he'll make me a much more well rounded drummer then I ever was before. Beginner or pro...you won't find a better teacher"
"Tony is a great teacher. He has taught my son timing, technique, and to enjoy music. 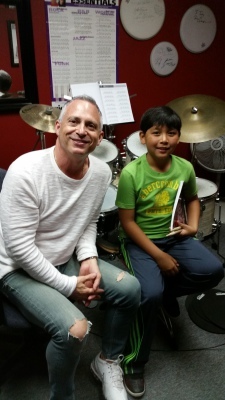 Tony's drum recitals are incredible as he organizes musicians to play along with our kids at each recital giving them a true musical experience. We love Tony!" 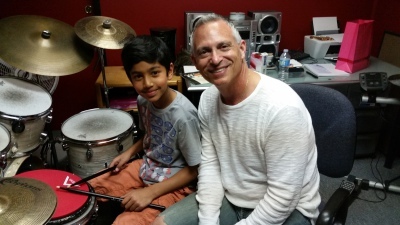 "My son took drum lessons with Tony for about two years. Tony always put everything into his teaching, and made his students and parents feel important. He also kept everyone well informed on what was going to be happening. Not only does he represent class and style, he is warm, kind, caring and enthusiastic about what he does. Locations to hold the concerts were always great. He taught my son so much for the time that he worked with him. We will remember those times fondly! Thanks Tony"
"I am lucky enough that I found a drum instructor who was willing to take on an old guy and work around my problems with arthritis, senior moments, bad vision, and an occasional decrease in motivation. While I am probably his oldest student, I have listened to him work with several younger, in some cases way younger, students and he is another one of those special people who can teach. Not everybody can teach. Of those that can, many don’t teach well. And, of those that can teach well, not all of them can teach well to people with a broad range of backgrounds, skill sets, motivations, and ages. Tony has the ability to teach well, no matter what your circumstances." "Tony was my drum coach many years ago. now my son goes to Tony. He was the best 13 years ago and still is!" I highly recommend Tony Capko as a drumming instructor. His professionalism and commitment to my son's music education paved the way for a successful college degree in music. "Tony is an excellent instructor. Our grandson has taken lessons from Tony for a little over a year and sets the pace to challenge him while maintaining an awareness of his level. Our grandson enjoys the lessons as he can see the improvement in playing the drums...."
"Tony is really very good at the art of teaching. 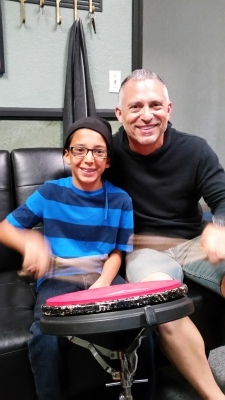 My son has picked up drumming very quickly, and looks forward to his lessons. I have nothing but good to say about Tony Capko"
"Great instructor, really takes the time to ensure you have a good grasp on what he is teaching." "I have known Tony for over 10 years and I have never known him to be any less than a consummate professional as a teacher, musician, drummer and as band leader. I have play gigs with Tony from orchestra pits, to funk bands, to big bands, to Motown bands, jazz combos and Top 40/show bands. Hire Tony and you won't regret it." "Tony is such an amazing asset to the Antelope Valley!!! My 9 year old has been taking lessons with him for a little over a year now. He is such a talented and professional musician who teaches with patience and motivates his students! He has an amazing repertoire of experience and is a true gem! You won't find a more talented, motivated, or professional percussionist anywhere! I highly recommend him!" Tony is an excellent instructor. Our grandson has a physical disability, a hip injury, making it difficult for him to use his foot in a normal position to play the drums. Tony has worked with our grandson, adjusting the drum set layout to allow him to enjoy playing the drums at their full capability. He has taken lessons from Tony for a little over a year. Tony sets the pace to challenge him while maintaining an awareness of his level. "It's been great working with Tony. He has taken the time to actually teach my daughter to read notes easier, understand the material, and doesn't rush her when he sees she's having difficulties. He tries other methods to explain ways to better grasp the troubled situation, whatever it is. So far so good with them both working as teacher and student. Thanks for your help in finding a great teacher that suited her needs." "The man knows his instrument and has outstanding skills in relaying his vast knowledge and practical experience to his students."